When I was about to get married, off I went down the street from my parents home to learn the fine art of making stuffed vegetable parathas from Mrs. Nirmala Sharma, a cheerful Punjabi lady and a family friend who in my opinion made the best mooli parathas. At this point in time, unaware that food would be my chosen profession, my sole determination of acquiring the talent for making good parathas was to feed my beloved to be husband with the best possible food, parathas being one of his favourites. Thereafter many evenings in Mumbai post our wedding were spent with me experimenting with different combinations of parathas and then us relishing the hot parathas with a green chutney made with mint and coriander leaves. 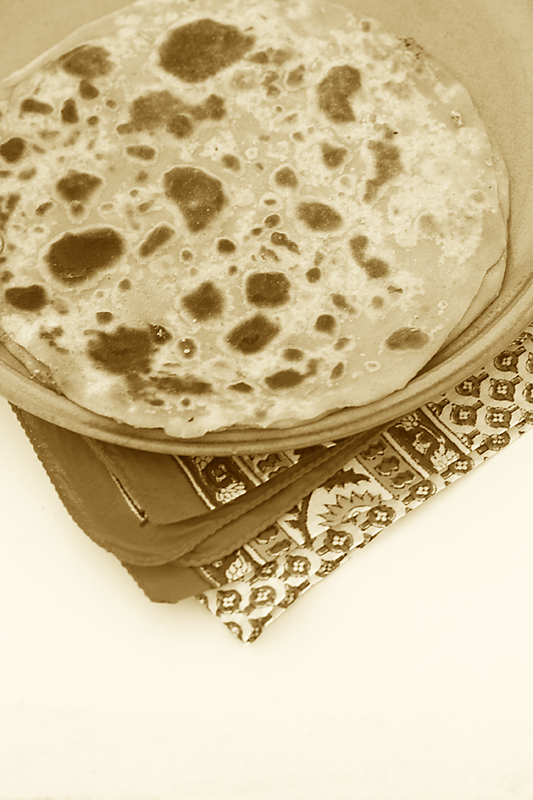 Down the years with a change in schedules, lifestyle and a baby, parathas had slipped out of our daily menus making an inconspicuous appearance only once in a blue moon. When my mother came to look after me during my recent bout of sickness, she made some awe inspiring parathas with various stuffings. And also revived my long lost love for these stuffed flat unleavened wholesome flat breads. I digged into my old recipe notebook, flipped the pages and found amongst a host of other parathas, my recipe for mooli or radish parathas with the spice combinations that result into luscious parathas written way back in 2007. The chutney adds zing, colour and also acts a a very good digestive. These parathas taste good with pickle too. Add some yogurt or lassi and you have a complete meal. Parathas taste good through the year but they are magical during the winters. 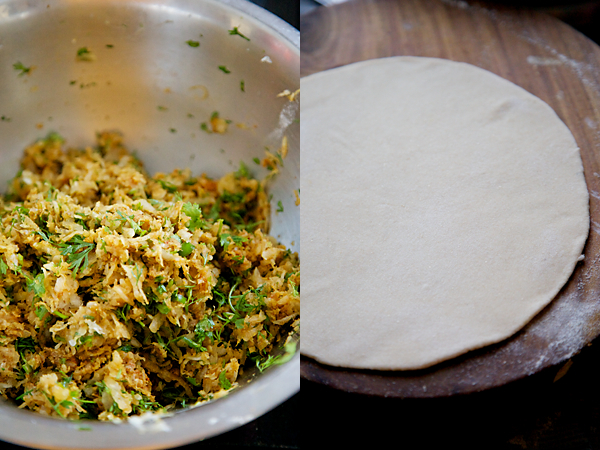 With the temperatures dipping in Mumbai, the mooli parathas we had for lunch today was satisfying and comforting. Go ahead and do make these parathas for a truly satisfying meal and remember not to skimp on the fat! Or compromise and have atleast one paratha with ghee or butter slathered over it for one of the ultimate taste experiences. 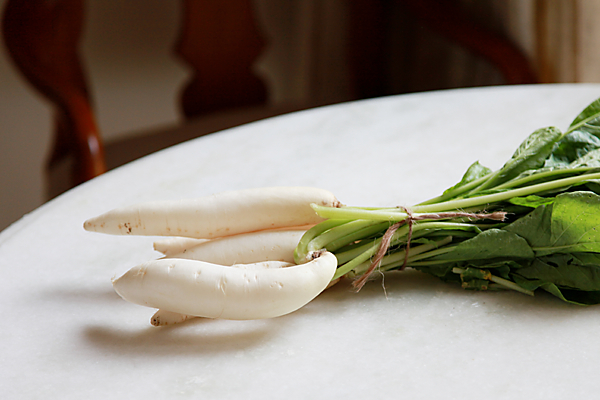 You could also use the radish leaves for the stuffing. Peel the radish, grate it, add the salt and allow to marinate in a bowl for about 15 to 30 minutes. Squeeze all the water from the radish and place in a cup or bowl. Using this water make a slightly stiff yet soft and pliable dough with the wheat flour using extra water if required. The radish juice and the water should measure up to approximately 3/4 th to 1 cup to get the dough of the right consistency. Allow the dough to rest for about 15 to 20 minutes. In another bowl, assemble the drained radish along with all the spices, the coriander, ginger, ajwain, asafetida, turmeric and red chili powders and the green chili if using and mix well. Divide the dough into 8 to 10 equal parts. Repeat the same for the radish filling as well. This way, you wont have excess dough or stuffing remaining. Take one portion of the dough, make it into a round ball with your palms and with the help of a rolling pin, roll it out on a clean surface to a 3” to 4” circle. Place one portion of the prepared radish stuffing and wrap it by gathering the edges and sealing the top of the dough with the stuffing inside it. Roll the stuffed ball of dough on the surface using flour while rolling it to prevent sticking of the dough into 6” to 8” circle. 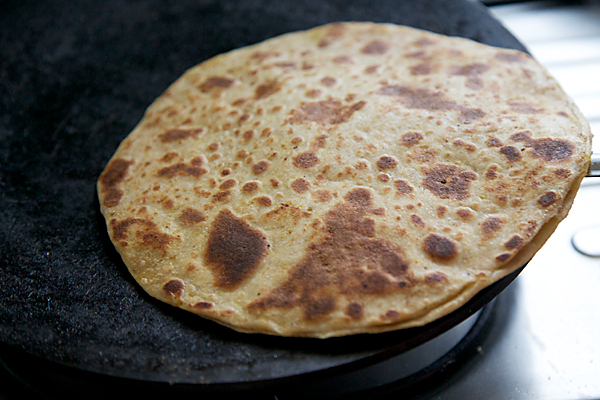 Heat a tava or a griddle over medium heat and place the paratha on it. Add 1/2 tsp oil around the edges. After a minute or two, when golden brown spots appear beneath the surface, flip the parathas and cook with another 1/2 tsp oil until golden brown spots appear. You might have to do this 2 to 3 times. 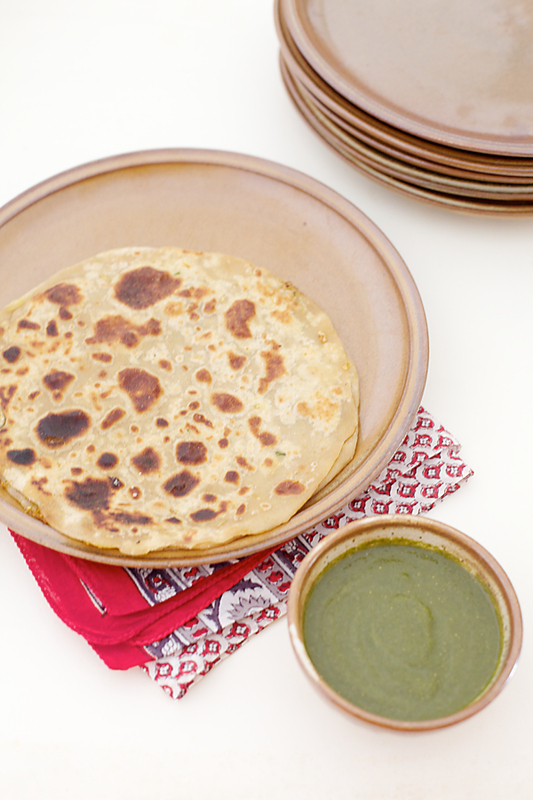 Use butter or ghee over the parathas for extra taste. 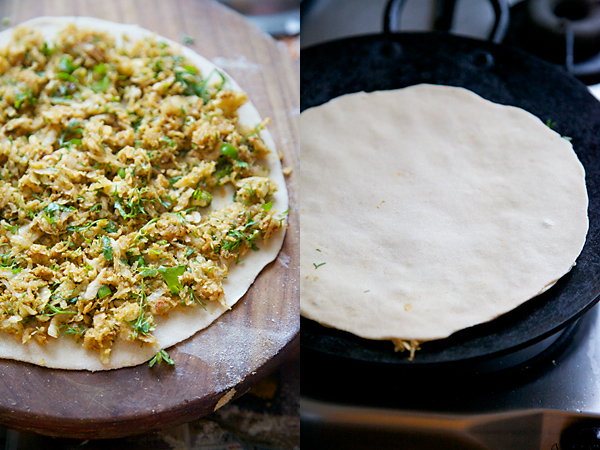 You can also make these parathas using this method (the one pictured above). Blend all the ingredients for the chutney and grind to a smooth paste using a little water. Glad that I am the first one to comment on your delicious parathas…..my husband is fond of these parathas and I always try to make a good one but in vain ….he always says that his mother used to make best of mooli parathas…..now I have the secret recipe of mummy ka magic and am going to make in my kitchen…..Thanks for sharing!!! They look yummmmmyy….will be trying them sooon…!!! even the simplest recipe becomes drool worthy when going through ur writing. 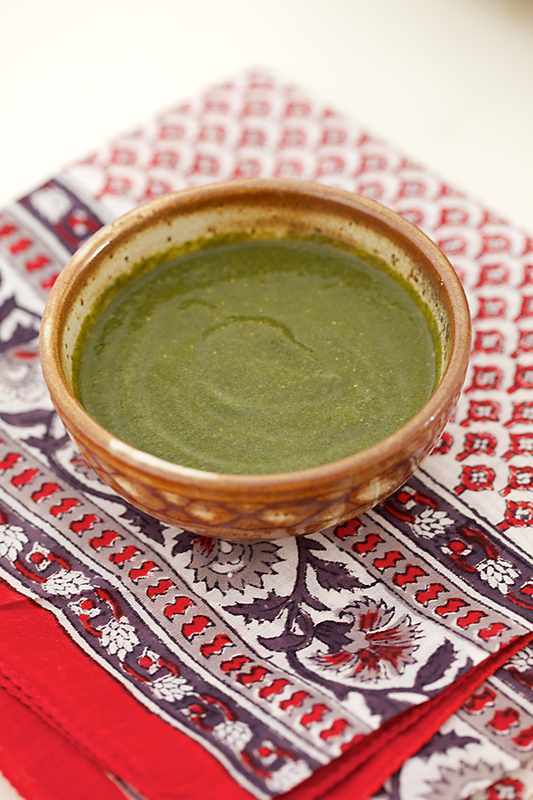 mint coriander chutney is indeed new and I am definitely going to try this combo. Hope u r doing well now. Tejal: I'm sure you will rock making these parathas! All the best! Bhavana: I'm lagging behind in answering my questions. Will do shortly. Nice to know about the halva. Vasumathy: That's a nice compliment indeed! Thanks! I'm feeling much better! Made me drool. Had them last when I was in India. Got to make some and like the idea of adding the leaves too. Thanks for sharing the recipe. Such a beautiful pârathas and chuntey,inviting.Droolworthy combo. Hi!Anu ,remember me?my hubby would luv to try them.can u also share some easy healthy snacks recipes for lunch box(for children)& recipe for sambhar for idli. Lovely write up Anushruti. I love paranthas in any form and I must say the cilantro mint chutny sounds too delicious and you add chat masala…it has to be yum! What a great wewebsite you've here. Make sure you update it more often. This subject areas is actually my attention. Thank you. Greetings from Idaho! I'm bored at work so I decided to browse your site on my iphone during lunch break. I love the info you present here and can't wait to take a look when I get home.